Understanding health care within a global perspective is critical for nurses who work in ever-changing health care delivery systems and interface with patients from around the globe. Becoming more familiar with health care systems outside the United States equips nurses to expand their perspective and provide care that is competent, compassionate and current. Students enrolled in this 3-credit hour course will examine nursing within the British health care system, including nursing education, nursing roles within the health care system and health policy. Students will have the opportunity to visit different types of public and private health care facilities, universities and clinics, learning from nurse experts in Great Britain. 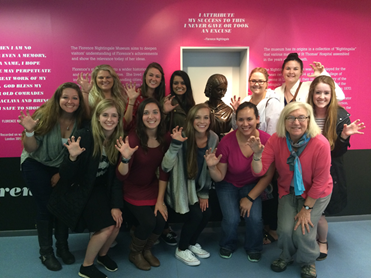 LHSON students and Dr. Lyn Prater visit the Florence Nighingale Museum in 2017.